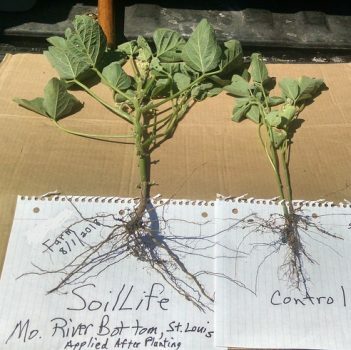 Soil Life was applied post-emerge on double crop soybeans after wheat in a 10-acre test plot in the Missouri River Bottoms near St. Louis. Plants from the test plot showed superior root development, greater plant vigor, more blooms and pod sets than the control. Soil Life was applied post-emerge at a rate of 1 quart per acre. Control plant showed significantly more heat stress. The test plot was planted at the same time as the control and with all other inputs the same. Images were taken August 1, 2018.